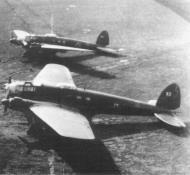 Heinkel He 111 H-3 White 5 of the Rumanian Air Force, operating in the central sector of the Russian front in mid 1941. This plane crashed due to bad weather during a night operation in July 1942 on Popesti-Leordene Airfield near Bucharest four men where killed one was a German. Heinkel He 111H-3 White 27 of the Grupul 5 of Rumanian Air Force, Corpul 1 Aerian, operating in Zaporozh'ye area of Ukraine, early 1943 due to damage and advancing Russian troops was abandoned at Stalino.